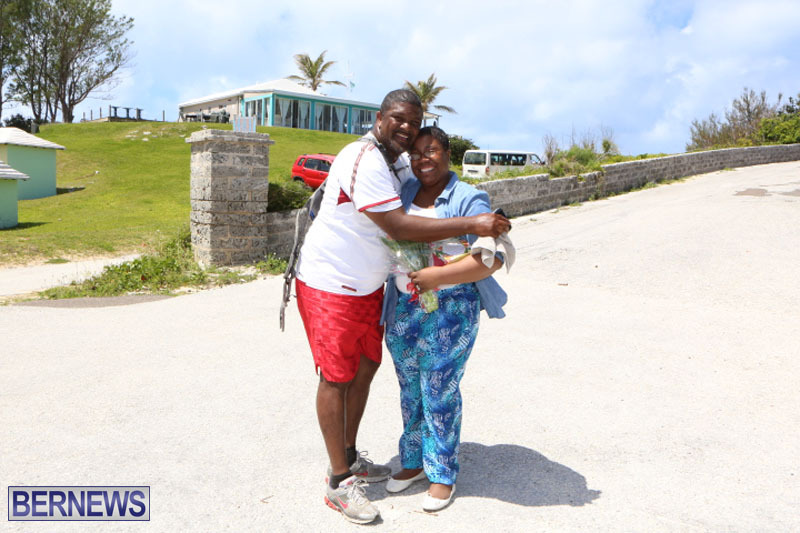 In a bid to raise money for his goddaughter Kamala Smith, who suffers from a rare form of cancer, Mark Anderson walked the length of the island today [Apr 8], setting off from Dockyard early this morning and being greeted by Mrs. Smith when he arrived in St. George’s this afternoon. Speaking before the walk, Mr. Anderson said, “It’s a very stressful time for my goddaughter, who is suffering from Leiomyosarcoma, a cancer of the smooth muscle and connective tissue, diagnosed in September of 2011. 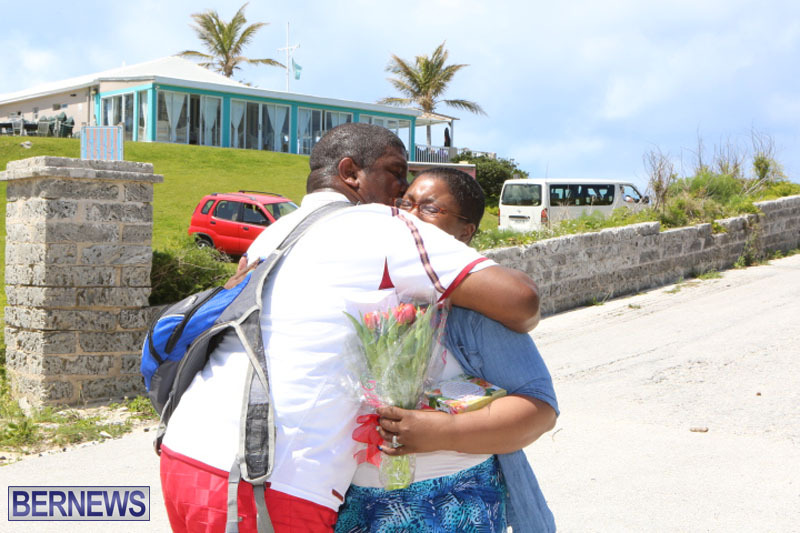 Speaking in St. George’s, a very emotional Mrs. Smith spoke of her appreciation for not only Mr. Anderson’s efforts, but for all the community support that she has received. “We are very humble people, we don’t like to ask for handouts, but it’s been really hard,” she said. “I am so grateful to everyone who has donated and helped over the last year and a half. 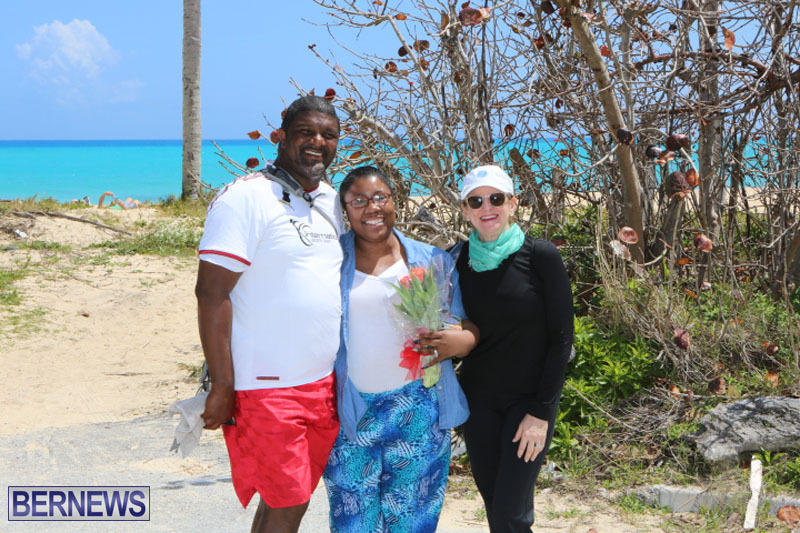 Mr. Anderson is asking the island to come together to support Mrs. Smith, encouraging people to donate $10 each in order to provide assistance for her and her family. Before setting out for the walk at 5.00am, he said that they had raised about $370, with another $300 collected from people donating as he walked. People interested in supporting Mr. Anderson’s quest to help Mrs. Smith can make donations to Bank of Butterfield account number 20 006 060 650 994 200. God bless Mark…..Well done you good and faithful Servant of the people. That’s what Bermuda is all about. Taking care of each other. Mr. Anderson, you are truly an inspiration. May God continue to bless you. God is good !!!! Wishing you a speedy recovery !!!! Mark you have a big heart and you will be blessed for you giving of your time and effort for this worthy cause. That said I will donate 10x what you are requesting. Mrs. Smith you are brave and I wish you all the best in your battle. Before you go back for treatment please ,please go to You Tube and search cannabis cures cancer. You will be amazed . This week end on ch148 there was a show on the very same subject. There is hope .God bless you and your family. You should open a gofundme account! You can reach the goal in no time! Mark you set a great example to all. We need more caring and compassionate people like you in this world. Well done brother. No Good deed goes un-noticed and God rewards the work of our hands by endorsing His promises toward us, truly Mark you have shown over and over again the love for humanity and the fact that what some take for granted because it is not their plight, God has blessed you with the spirit of empathy and as you continue to give into the lives of countless others by words o deed, your living will never be in vain. May the funds raised and the awareness that has been shown towards your goddaughter be a reminder of how much we all need each other, but more importantly by putting the love of Jesus Christ into action, goes a long way in life, for those we can reach and for ourselves, God bless and well done once again. Mark, as always, you inspire us to be better people. To the woman who walked with you, you are an example of kindness. Will keep Ms. Smith in my prayers.